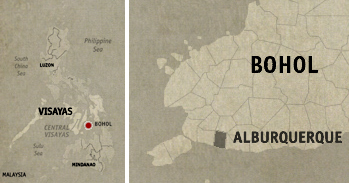 Much has been written about the destruction that the magnitude 7.2 earthquake has done to Bohol last 2013. 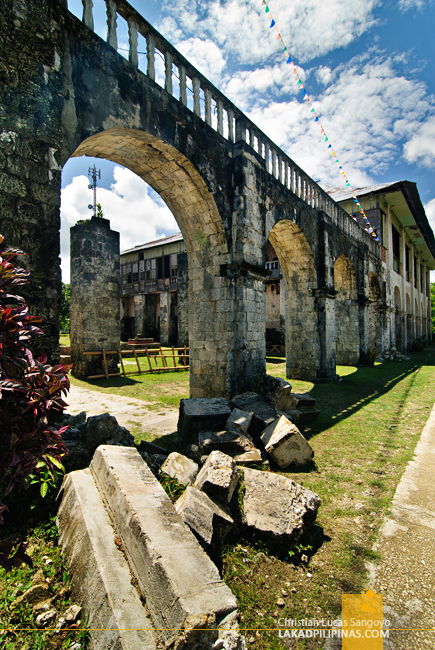 It laid waste to numerous Spanish-era churches in the region, but there are a few that were able to withstood the 34-second shaking, and one of this is Alburquerque’s Sta. Monica Church. Standing proud on a low knoll with its singular belfry, the Sta. 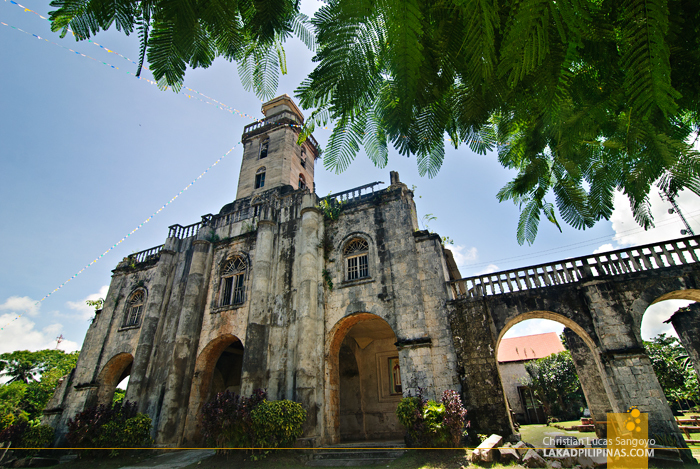 Monica Church was built in 1842 and is considered as one of the oldest stone churches in the Philippines. 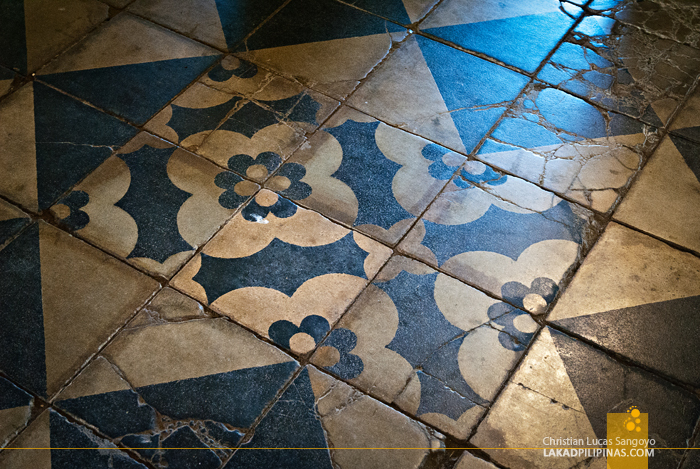 From frail materials, the church structure has since been replaced by coral stones and through the years parts have been added with concrete. The name of the town itself is quite intriguing. Initially, I thought it was named after a place in New Mexico, but upon further research, found that it was based rather on a Portuguese seafarer, Alfonso de Albuquerque. Note however the missing R in Albuq. In fact, locals often call the town in its shortened form, Albur. 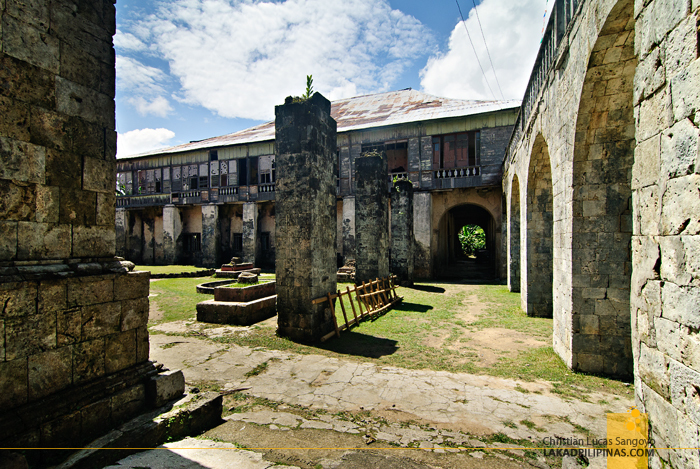 The Augustinian Recollect friars used to run the Sta. Monica Church and one can easily see the patina of history through its rough walls. 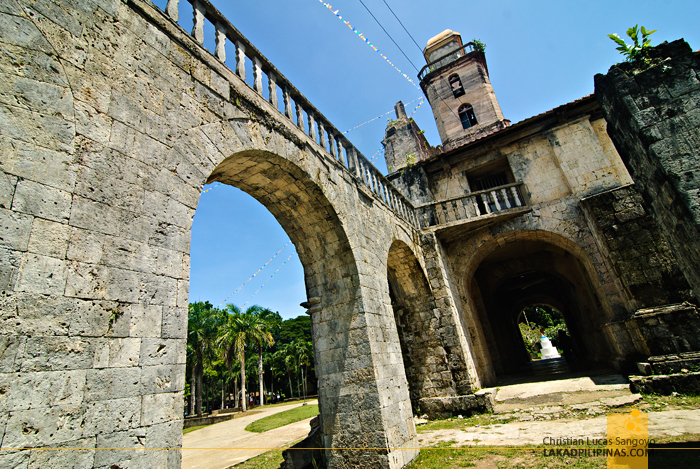 Its facade is quite different from most Spanish-era churches in the country with its central quadrangular belfry and its rounded pillars running along its elevation. 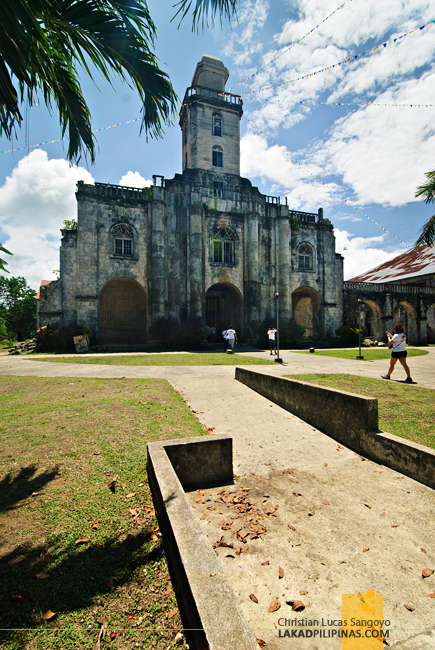 It is said that there are three bells housed in the tower, the two inscribed with the names of the parish patrons, Sta. Monica and San Agustin. The third, oddly inscribed with the name Calipay, which means joy in the vernacular. It was just unfortunate that we were not able to access the belfry. To the right of Alburquerque Church, a series of arches connects the church to an old convent and beyond that a courtyard. There is a ruin of an unfinished grotto, hidden from sight at the back part of the court, a probable series of unfinished arches forming another arcade. Inside, the church ceiling is the first thing you’ll notice. Made from tin, religious scenes are painted over in the trompe-l'oeil style. 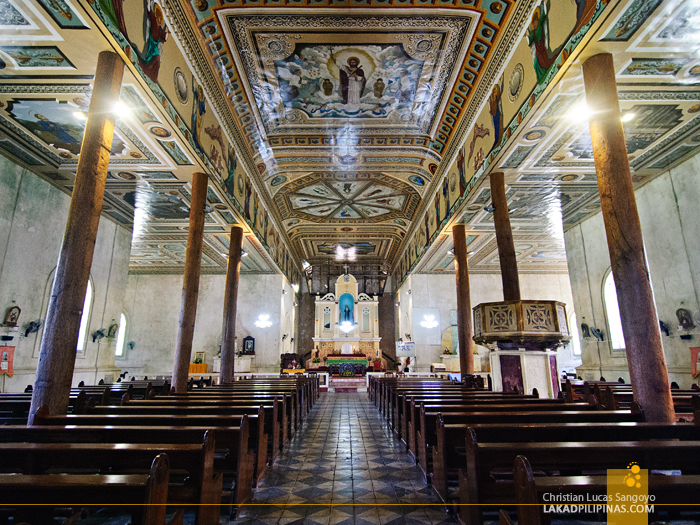 The mural was painstakingly done in a period of five months by a Cebuano artist Ray Francia (restored by Guy Custodio) who also did a lot of the ceilings in other Bohol churches, including the famous one in Dauis. Another unique feature of Sta. Monica Church in Alburquerque is its pillars. 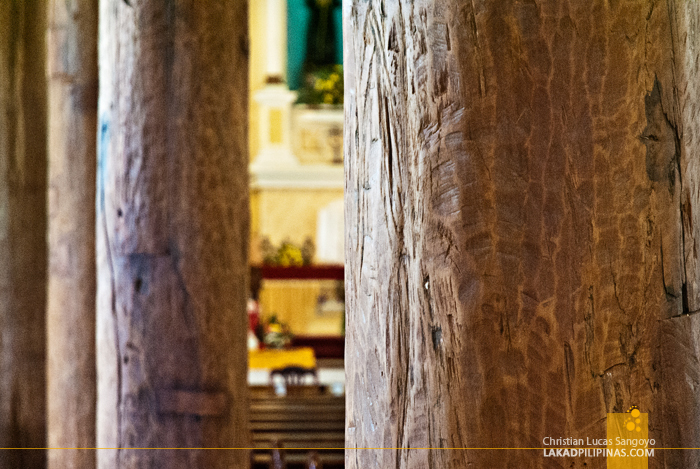 Made from unfinished tree trunks, it is said that these are the reason why the church withstood the massive quake that rocked Bohol. I have not seen anything remotely like it in any of the churches I’ve visited anywhere. The Sta. 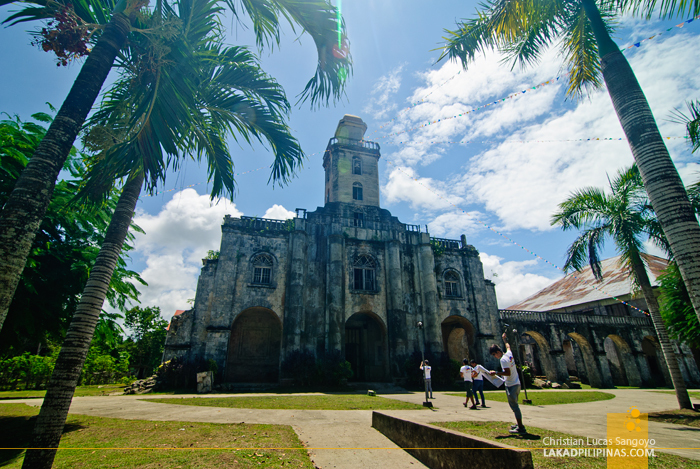 Monica Church is an often overlooked gem in Bohol, being in close proximity to the more famous Baclayon Church. But it’s a heritage site worth more than a curious few minutes of a road stop by. Please note that the original ceiling murals were painted by the late Raymundo Francia in 1932 but the picture above or shown in your site is a restored painting by artist/painting conservator Guy Custodio.